Last redesigned for model-year 2014, the Highlander is one of the oldest vehicles in the class, heightening anticipation for its coming remake. A more carlike alternative to Toyota’s rugged 4Runner and its full-size Sequoia — both of which are body-on-frame SUVs — today’s Highlander isn’t as spacious as the Traverse or as engaging to drive as the Pilot. But it does a fine job balancing room and road manners with exceptional refinement, a host of standard safety features, and Toyota’s reputation for reliability and resale value. The formula is sales gold. Through early 2018, Highlander is America’s top-selling eight-passenger midsize crossover and trails only the Ford Explorer among three-row entries in the segment. You shouldn’t. Aside from a new paint color or two, Toyota is unlikely to update a vehicle so late in its lifecycle. Highlander was last refreshed for model-year 2017, getting updated styling, a new V-6 engine, an upgraded transmission, and a host of standard safety features — including autonomous emergency braking – as standard on every trim level. These changes kept it wholly relevant in a segment in which virtually every rival is newer. As for timing of the next Highlander, Toyota crossovers generally have a six-model-year lifecycle. That suggests the fourth-generation Highlander would be introduced during 2019 as a 2020 model. However, some industry sources report it’ll be pushed back to 2020, as a 2021 model, to give engineers time to adapt it to the Toyota New Global Architecture (TNGA). TNGA is the automaker’s modular underskin platform that can accommodate a variety of cars and crossovers. It’s used on the Prius hybrid and Camry midsize sedan and will underpin the redesigned 2019 Avalon full-size sedan and RAV4 compact crossover. Waiting for the 2019 Highlander likely will mean confronting higher asking prices. Even with Toyota’s frequently generous incentives, you might end up paying more for a vehicle that’s essentially a repeat of the 2018 Highlander. 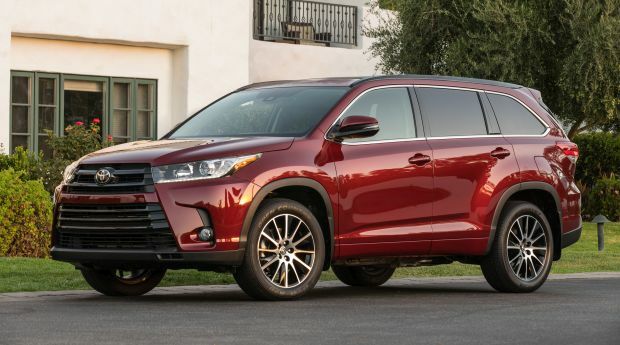 There is a qualifier, however: should Toyota launch the redesigned Highlander as a 2020 model, the automaker and its dealers will offer significant discounts to clear inventories on the soon-to-be-replaced 2019s. Given the slim chance that Toyota will give the 2019 Highlander any changes worth waiting for, buying 2018 gives you an extra year or two before this design becomes dated. The ’19 Highlander lineup should be a rerun of the ’18. That means six trim levels and the choice of conventional gasoline or gas/electric hybrid propulsion. Gas-only versions would reprise LE, LE Plus, XLE, SE, Limited, and Limited Platinum trim levels, all available with front-wheel drive or traction-enhancing all-wheel drive (AWD). Hybrids should again come in LE, XLE, Limited, and Platinum trim and would be AWD only, with a dedicated electric motor providing power to the rear wheels as needed. No. It’ll reflect the 2017 styling updates, most of which were to the front end where a split grille replaced the 2014-2016 models’ single unit. The rest of the body received nip and tuck tweaks for a sportier appearance. The SE is the most aggressive-looking of the lot, with unique 19-inch machined alloy wheels and a lowered sport suspension. Hybrid are distinguished only by a blue Toyota emblem on the grille and hybrid badges on the doors and rear liftgate. 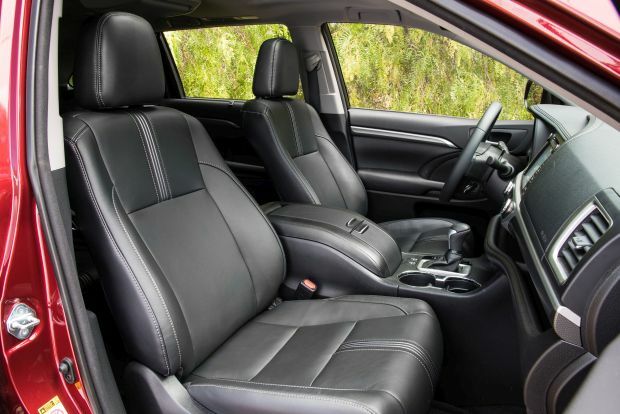 The 2019 Highlander’s cabin wasn’t updated for 2017, and that’s no criticism. It’s a standout for design, room, and materials quality. Instrumentation is large and clear, with Hybrid models adding a visually interesting power-flow gauge. All grades will again include touchscreen infotainment, with the LE getting a 6.1-inch central screen and all other models an 8-inch display. Toyota is in the process of integrating Apple CarPlay compatibility, but it’s uncertain whether Highlander will get it before the coming redesign. Instead of CarPlay (or Google Android Auto), Toyota favors its proprietary Entune system, which can be a bit clunky to use. For example, on models not equipped with imbedded navigation, you must use a Toyota-supplied smartphone app to get GPS mapping to appear on the central display. Some of the capacitive buttons that surround the screen are a stretch to reach for the driver. Further, the display is angled in such a way that it washes out in direct sunlight even if you’re not wearing sunglasses. That’s the extent of our complaints about the cabin. The front and second-row seats are plush, extremely comfortable, and provide outstanding headroom and legroom. We particularly appreciate the available power-adjustable thigh support for the driver’s seat. LE, LE Plus, Hybrid LE, and Hybrid XLE models can seat up to eight thanks to three-across benches in the second and third rows. Other Highlander grades accommodate up to seven because they substitute captain’s chairs in the second row. Note that you can change them out for the other models’ three-place bench at no extra charge, bumping capacity back up to eight. All models include five USB charging ports, though they’re for first- and second-row occupants only. The third row is optimally suited for kids. Medium-sized adults will fit back there, though they’ll really be comfortable only if the second-row seats are pushed well forward. Cargo volume is surprisingly good given Highlander’s relatively tidy size; stem to stern, it’s the shortest three-row crossover in the class – good news for garage-ability. There’s 13.8 cubic feet behind the third row, 42.3 behind the second, and 83.7 behind the first. Small-items storage is outstanding, with special mention for a cleverly integrated shelf that runs half the length of the dashboard. The center console is not especially wide, but it’s very deep. All but the gas-powered LE come with a power rear liftgate, but none offers the convenience of hands-free operation. Extremely unlikely, given the 2017 updates to the gas-only V-6, which should remain Highlander’s most popular drivetrain by far. It should return as optional for the front-drive LE and standard on all other gas-only Highlanders. The 3.5-liter six produces a healthy 295 horsepower and 263 pound-feet of torque. It teams with an 8-speed automatic transmission. Standard again on the gas-only LE with front-wheel drive should be a 2.7-liter four-cylinder with 185 horsepower and 184 pound-feet of torque. It pairs with a 6-speed automatic transmission. We’re a bit perplexed that Toyota continues to offer this combination. It’s slow and not particularly smooth. Plus, its EPA-estimated fuel-economy ratings are worse than those of the more potent and refined V-6. Hybrid grades would reprise a 3.5-liter gasoline V-6 that produces 231 horsepower and 215 pound-feet of torque. It pairs with three electric motors, one that assists the transmission and starter, one that assists in driving the front wheels, and one that provides power to the rears when needed. They would use a continuously variable automatic transmission. We recommend the gas-only V-6 as the best way to motivate a Highlander. Power is smooth and strong, and the new 8-speed transmission shifts promptly. Hybrids are more than 200 pounds heavier than their gasoline counterparts, blunting acceleration. Their “Eco” drivetrain setting dulls throttle response further to the point where we felt nervous merging into fast-moving traffic with it enabled. Handling is poised, with decent steering feel and moderate body lean in fast turns. Quietness is a hallmark. Despite Highlander’s tall, slab-sided build, wind and road noise are virtually non-existent. The conventional and hybrid V-6 engines produce a refined growl during acceleration and fade into near-silence at cruising speeds. 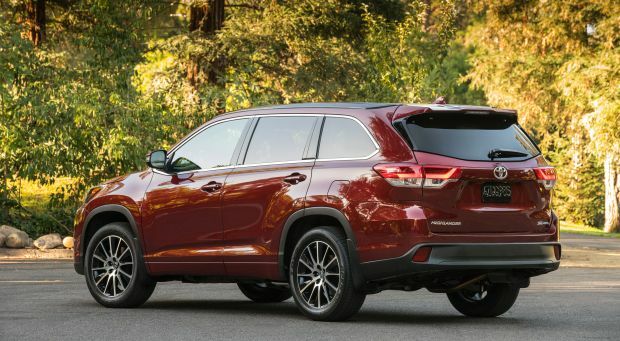 Absent powertrain changes, 2019 EPA ratings should mirror those of the 2018 Highlander. That means the four-cylinder LE would again rate a surprisingly poor 20/24/22 mpg city/highway/combined. With the gas-only V-6, 2019 Highlander LE models should repeat at 20/27/23 mpg with front-wheel drive and 19/26/22 with AWD. Front-drive versions of the LE Plus, XLE, SE, Limited, and Platinum should again rate 21/27/23 mpg. Expect the AWD LE Plus to remain at 20/27/23 mpg while all other AWD grades again rate 20/26/22. Highlander Hybrid is America’s most fuel-efficient three-row crossover, despite coming standard with AWD and carrying a curb weight of up to 4,861 pounds. For 2019, LE grades should again rate 30/28/29 mpg while the XLE, Limited, and Platinum repeate 29/27/28. In our test of a Hybrid Platinum, we achieved 27.4 mpg in an even mix of city/suburban commuting and highway use. All Highlander models would use regular-grade 87-octane fuel. Very unlikely, and then none certain to be worth waiting for. Note that trim levels generally align between the gas-only and hybrid models in terms of standard and optional equipment. All’19 Highlanders will again come standard with Toyota Safety Sense P (TSS-P), which is a suite of driver-assistance features that includes forward-collision warning with autonomous emergency braking and pedestrian detection, lane-departure warning with automatic steering correction, automatic high-beam headlights, and radar cruise control to maintain a set distance from traffic ahead. Kudos to the automaker for including these valuable aids on every Highlander, although it probably will continue to limit blind-spot and rear cross-traffic detection to XLE models and above. The 2019 LE will again come with the expected array of power accessories, plus a rearview camera, eight-passenger seating on cloth upholstery, remote entry, five total USB ports, and a basic version of Toyota’s Entune infotainment on a 6.1-inch touchscreen display. The LE Plus would add fog lights, height-adjustable power rear liftgate with separate opening glass (a rarity in the class), three-zone automatic climate control, 8-inch infotainment screen with GPS navigation available through a connected smartphone and dedicated app, power driver’s seat, and upholstery made of cloth and Toyota’s SofTex leatherette. XLE grades would again build on that with a power sunroof, leather upholstery for the first two seating rows (the third row uses SofTex), heated front seats, keyless access with pushbutton engine start, power front-passenger seat, imbedded GPS navigation, second-row captain’s chairs, second-row side-window sunshades, and Toyota’s “Driver Easy Speak” which uses a microphone in the overhead console to amplify the driver’s voice and broadcast it through the rear speakers. The 2019 SE will again add a sport suspension, 19-inch wheels in place of 18s, and unique interior trim. Expect the Limited to return with LED daytime running lights, upgraded leather upholstery, driver-seat memory, ventilated front seats, JBL-brand audio system, and rear-obstacle detection. The range-topping 2019 Platinum should again get a panoramic sunroof, rain-sensing windshield wipers, heated steering wheel, heated second-row seats (included with the captain’s chairs or bench seat), surround-view camera, Toyota’s Safety Connect telematics, and front-obstacle detection. They’ll probably rise, although because the 2019 Highlander will likely see no changes, Toyota could keep increases to a minimum or even hold the line on prices for some models. For most of its life, Highlander was one of the costliest midsize crossovers, but in recent years the competitive set has caught up. In a few instances, models such as the Chevrolet Traverse High Country, Ford Explorer Platinum, and Honda Pilot Elite have surpassed it. For reference, we’ll list 2018 Highlander prices, which include Toyota’s $995 destination fee. The only factory options were a no-cost second-row bench seat on seven-passenger models and a $1,810 rear Blu-ray entertainment system for XLE and Limited grades. The front-drive LE four-cylinder started at $32,025. Add $2,050 for the V-6 engine. The rest of the 2018 front-drive Highlander lineup consisted of the $36,455 LE Plus, the $39,915 XLE, the $41,085 SE, the $43,075 Limited, and the $46,195 Platinum. Adding AWD to any V-6 model cost another $1,460. Highlander Hybrid prices started at $37,655 for the 2018 LE, $42,725 for the XLE, $46,155 for the Limited, and $49,275 for the Platinum. Our pick for best value would be the gas-powered AWD Limited, which has a 2018 list price of $44,535. Expect a 2019 Toyota Highlander release date in the fall of 2018. Some clarity on the timing of the redesigned model. Barring that, we’re content with Toyota carrying over the current Highlander for 2019. It would make sense for the automaker to drop the underwhelming four-cylinder drivetrain because the conventional V-6 is smoother, more powerful, and just as, if not more, fuel efficient.